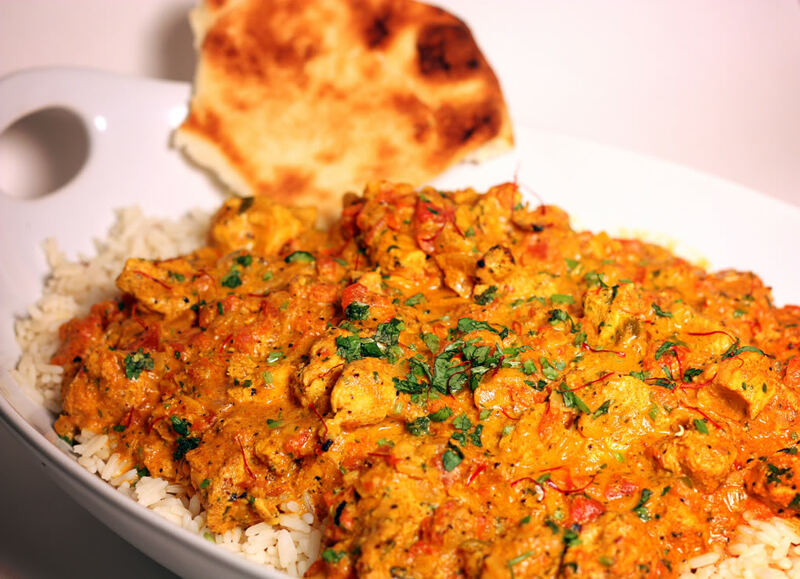 This classic Indian comfort dish, Chicken Tikka Masala, is found on most Indian menus is packed with bold flavors and easy enough to make at home. If you’re reading this, you’ve gathered that I made the cut from 1889 to 400 contestants in the Project Food Blog! So, I definitely want to say thank you to everyone who voted for me! Thanks, y’all! This challenge is a test of comfort. We were asked to make a classic dish from a different culture that was out of our comfort zone; possibly one that we weren’t all that familiar with or have never made before. I was a little stumped to begin with because there are so many ethnic cuisines out there that are challenging and complex. I finally decided to go with Indian cuisine. I really like all of the layers of flavor and heat that makes up a lot of Indian recipes…the catch is that I have never made any before! After some suggestions from good friends, I settled on a traditional classic, Chicken Tikka Masala, which is a delicious dish, that I imagine is a soul warming Indian comfort food. Marinated pieces of chicken are grilled and then added to a rich, spicy cream sauce. The combination of Indian spices, saffron and grilled chicken add a smokey flavor to the dish. I served it over steamed rice along with warm Naan, which are South Asian flat breads, particularly popular in India. Grind the chopped cilantro (keep some aside for garnishing) and all other marinade ingredients (except yogurt) to a smooth paste in a food processor. Pour into a large bowl and stir in yogurt; mix well. Add the chicken pieces and mix well. Cover the bowl and refrigerate. Allow to marinate overnight. Thread the chicken onto skewers and keep ready. Preheat your oven or grill to medium high (400F). Grill chicken until cooked through, about 8 to 10 minutes. Sauce: In a deep pan, over medium-high heat, melt butter and add the onion. Cook until soft. Add the cardamom, garlic, and chilies. Saute until fragrant, about 1 minute. Deglaze pan with white wine. Add the garam masala, brown sugar, and tomatoes; mix well. Cook until the tomatoes are soft and a thick paste forms. Stir in cream. Add saffron and grilled chicken; stir. Cook, stirring occasionally for about 5 more minutes. Remove from heat and stir in cilantro. Adjust seasoning with salt, to taste. Garnish the dish with chopped cilantro leaves and serve hot with Naans and steamed rice. Garam Masala (optional): Place the cumin, coriander, cardamom, peppercorns, cinnamon, and cloves in a dry heavy skillet over medium-high heat. Toast the spices, stirring occasionally, until they turn several shades darker and give off a sweet smoky aroma, about 10 minutes. Do not raise the heat to quicken the process, or the spices will brown too quick and not be toasted all the way through. Cool completely. Working in batches if necessary, transfer the mixture to a spice mill or coffee grinder and grind to a powder. Stir in nutmeg and saffron. Use immediately or store in an airtight container in a cool, dry place for up to 3 months.